The December 19th, 2009 blog entry 'Drivel' took issue with the 'manufacturing in the U.S. is in complete decline' meme. 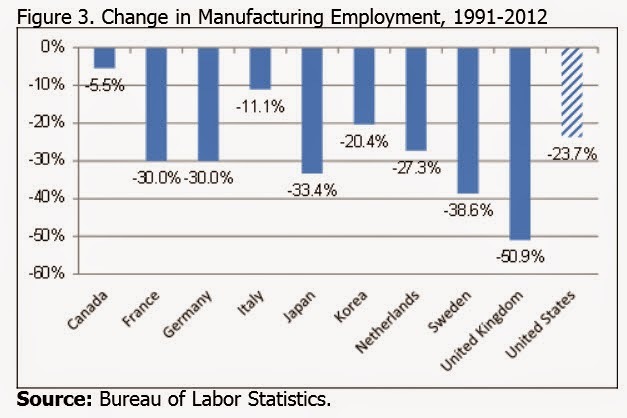 A recent (July 2014) CRS article, Measuring the Loss of Manufacturing Jobs,explains that manufacturing job loss data "... suggest that the United States is not an outlier when it comes to losing factory jobs...Over the entire period between 1991 and 2012, the most recent year for which comparative data are available, the United States shed 23.7% of its manufacturing jobs. This was a smaller percentage decline than that experienced by many peer economies, including France, Germany, Japan, the Netherlands, Sweden, and the United Kingdom..."
"... the overall size of the US industrial base – real value-added in manufacturing – has been growing rapidly for more than four decades, and is on track to surpass the all-time 2006-7 high before the end of 2014..."
"...Real value-added in manufacturing grew by 3.1% per year over the entire period 1960-2007, and after a dip during the recession recovered with 4% per year growth from 2010 through 2013. Even with a growth rate no higher than 2.8% per year, the absolute size of the US industrial base – total value-added in manufacturing – will surpass the all-time 2006-2007 high before the end of 2014..."
"... A careful look at the most recent and detailed data shows that despite falling employment, the US manufacturing base is growing larger, more productive, and more competitive."